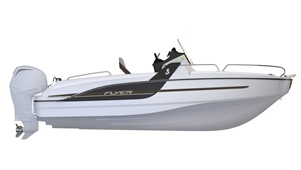 With a cockpit and an impressively large forward sun lounger, the Flyer 6.6 SUNdeck gives overp 50 m² to sunbathing. Inside, the cabin makes use of all the available space and allows you to spend the night on board this dayboat. Equipped with the latest generation of Airstep® technology, this outboard speedboat offers cruising comfort second to none. 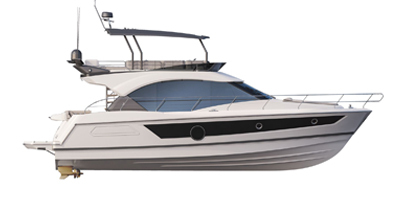 The Flyer 6.6 SUNdeck is strikingly elegant with a sporty style emphasised by the lateral profiles struts and incisive windshield design. With strong choices in terms of deck layout, this version makes the best of all the space given over to relaxation. Very narrow at the bow, her special V-shaped hull deflects waterperfectly. A brown line along the side characterises the Flyer SUNdecks.